Jackie has been with Sonoco Products Company since 2003. She has over 20 years of HR and leadership experience. She received Sonoco’s “People Award 2013” in recognition of her efforts leading the development and implementation of a program teaching Leadership Fundamentals and is Certified as a Coach by the Center for Creative Leadership. She received a Bachelors of Business Administration with a major in Finance and an MBA with a Human Resources Emphasis from the University of Wisconsin – Oshkosh. In the past she has been the Accounting Manager and the Director of HR for Admanco as well as the School District Accountant in Ripon, WI. 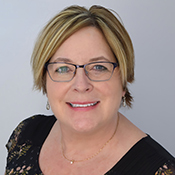 She is a member of the Fox Valley Chapter of SHRM and has volunteered on both the WISHRM State Conference Planning Committee and the WISHRM State Leadership Conference Planning Committee. Jackie is also a Past President of the Ripon Early Bird Kiwanis club.